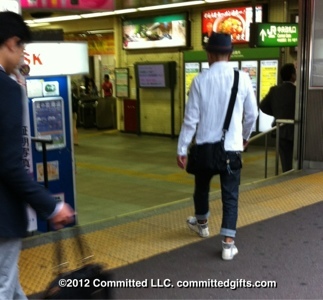 Tokyo by Design | Committed. I really wanted to cover the experience of visiting this city with a toddler, which may happen later, but I was immediately struck by the little design details around the neighborhood. So let’s start there, shall we? 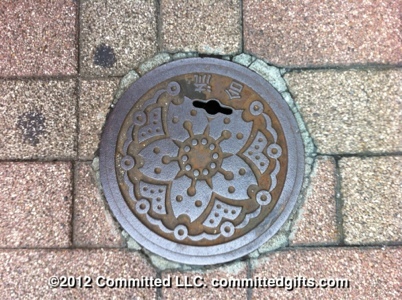 Even the sewer or water drains are pretty. 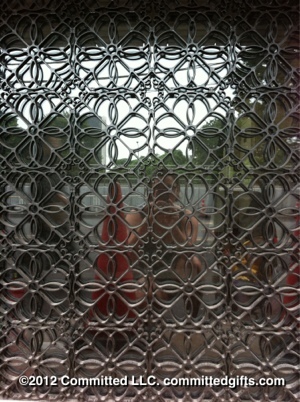 I really loved the geometric floral pattern on this grate. This illustration style reminded me of children’s books from the 1960’s. Plus I’m a sucker for graphic illustration and primary colors. Everything is so cute, even the sides of busses. 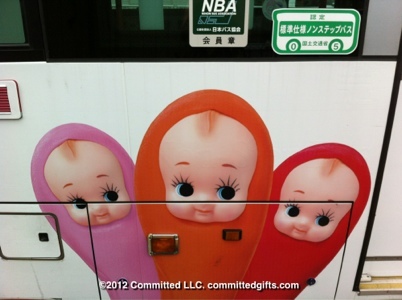 I don’t know if these kewpies were selling anything or merely decoration, but I had to snap them. I wish I’d gotten a better pic of this gent. He must have been in his 60s or 70s and was the hippest guy I’ve probably ever seen. 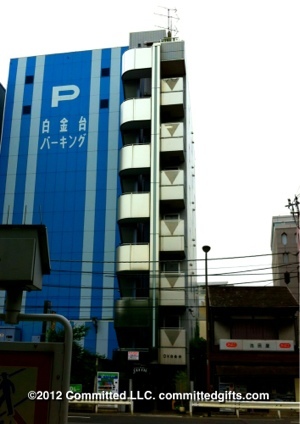 Skinny building. Probably 12 feet wide. I’m noticing a distinct discord in architectural styles and functions. 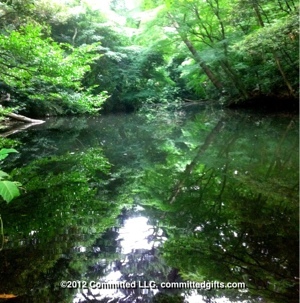 Our first adventure was to the Institute of Nature Study near Meguro station. 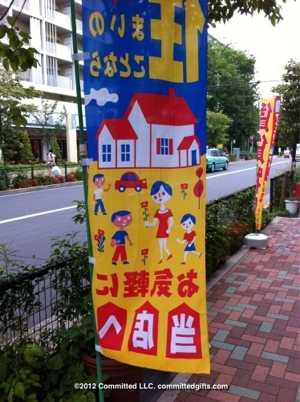 It’s a really affordable (300Y) and quiet retreat from the city noise. Its basically a forest with lovely bird calls in the middle of the city. I really wanted to visit the adjacent Teien Art Museum, but it was closed for renovations. 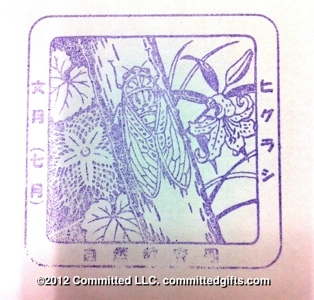 I think this was a stamp for some kind of passport system for kids. Regardless, I thought it was pretty. 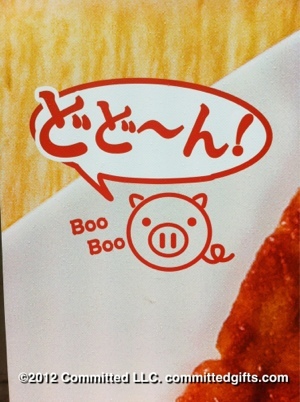 Even pork is kawaii! And it’s named after my cat! 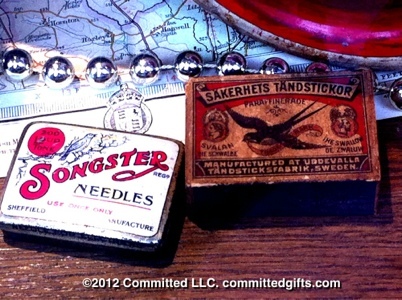 I loved these antique packages I saw in the window of a teddy bear shop. All in all, I have a great feeling about this trip. All the little old ladies love my daughter, and the language barrier isn’t a barrier at all. Like I said, we stopped in a back alley noodle joint for lunch. All I knew to say was “Soba.” We had a delicious cheap messy lunch (still learning how to feed noodles to a toddler with chopsticks). It was 600Y (about $7), and the lady held my daughter while I picked up noodles and paid the check! She even carried her out and helped me set up the stroller for the rain. I don’t know if I’d get the same treatment if I was traveling alone, but I’m grateful that people are so kind to both of us.